These great-tasting grilled sandwiches are the perfect vegetarian option to serve at your next family cookout. 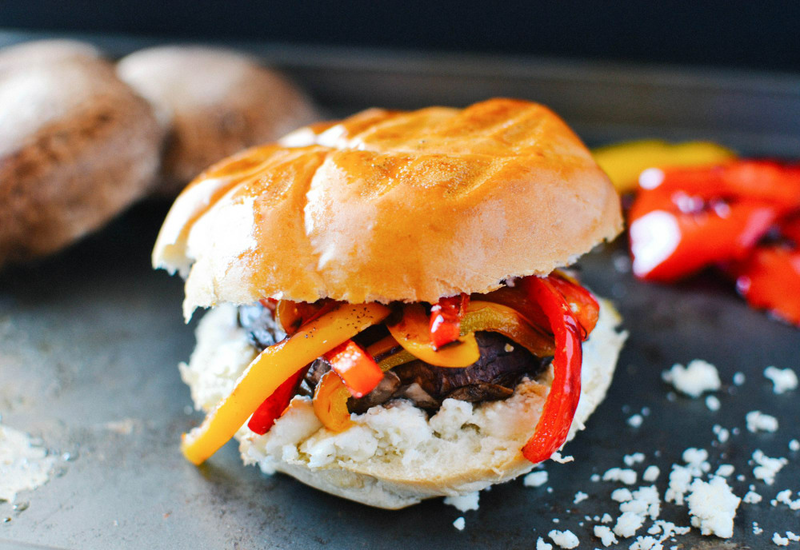 Kaiser rolls are filled with grilled portobello mushroom caps that have been flavored with garlic and balsamic vinegar. They are then topped with grilled bell peppers and finished with crumbled goat cheese. These sandwiches are hearty, filling, and packed with flavor. Basil brings in the fresh flavor of summertime. This quick and easy meat-free meal is ready to enjoy in under 30 minutes. Portobello mushroom caps are a great vegetarian stand in for meat patties. A nice sear on the grill mimics the charred flavor experience. Per Serving: 177 calories; 10g fat; 13.7g carbohydrates; 8g protein; 13mg cholesterol; 242mg sodium. These grilled portobello sandwiches were awesome. Not only was it quick to make, but the bell pepper and basil gave it excellent taste. Great vegetarian lunch or dinner meal for weeknights or laid back parties. This was amazing! If you like mushrooms, you will love this dish. The creamy goat cheese and bell peppers was so good, I'd definitely make this again. Delicious sandwich! The mushrooms are very aromatic and flavorful. I made it on my indoor grill / panini press, it was super quick and easy..
Made these for some vegetarian friends that came over to my house for a party. Instead of basalmic vinegar I used red wine vinegar to toss the peppers in, it was very flavorful. I used my indoor electrically heated grill to make these portobello sandwiches. I love how quick they were to make. If you like mushrooms, the recipe is a must try. I didn't have any basil, but it didn't feel like anything was missing in terms of flavor. I love the way it turned out.